Researchers at the Universities of Southampton, Manchester and Keele are co-authors on a publication which has won the Royal College of GP's (RCGP) 2013 Research Paper of the Year Award. The paper, which was published in the BMJ earlier this year, explored the process that enables patients to self-manage their own illnesses. The paper suggested that there are too many challenges in current priorities of primary care for clinical staff to provide patients with self-management support, leaving patients to find their own ways to manage their condition in day-to-day life. 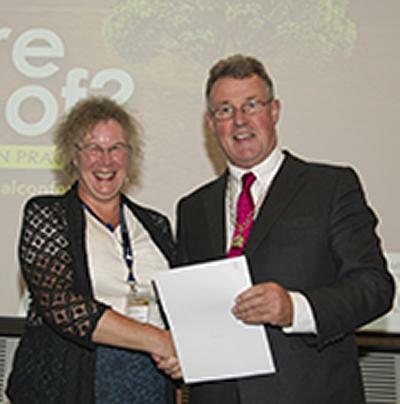 The award was presented at this year's RCGP 2014 annual conference. The Research Paper of the Year award gives recognition to an individual or group of researchers who have undertaken and published an exceptional piece of research relating to general practice or primary care. Dr Anne Kennedy, Senior Research Fellow at the University of Southampton, who led the study comments: “We are all so pleased to accept the award which recognises the importance of the challenging findings of this study to patients, professionals and policy makers. The winning paper is entitled: 'Implementation of self-management support for long term conditions in routine primary care settings: cluster randomised controlled trial'. The paper’s authors are: Anne Kennedy, Peter Bower, David Reeves, Tom Blakeman, Robert Bowen, Carolyn Chew-Graham, Martin Eden, Catherine Fullwood, Hannah Gaffney, Caroline Gardner, Victoria Lee, Rebecca Morris, Joanne Protheroe, Gerry Richardson, Caroline Sanders, Angela Swallow, David Thompson, Anne Rogers. Entries are submitted under one of the categories of: Cancer; Cardiovascular Endocrine and Renal; Reproduction, Children, Genetics and Haematology; Neurology, Mental Health and Dementia; Primary Care, Public Health, Service Delivery and Musculoskeletal; Urgent Care, Infections, Respiratory and Gastroenterology. The winning paper was selected as the winner of the category which includes Primary Care, Public Health, Service Delivery and Musculoskeletal. The winning paper was published by the BMJ in March 2013 and the award was presented to the authors at the RCGP Annual Conference, where a member of the team of researchers has been asked to give a short presentation followed by a question and answer session.